Second Act Communities is working towards addressing Veterans Homelessness. 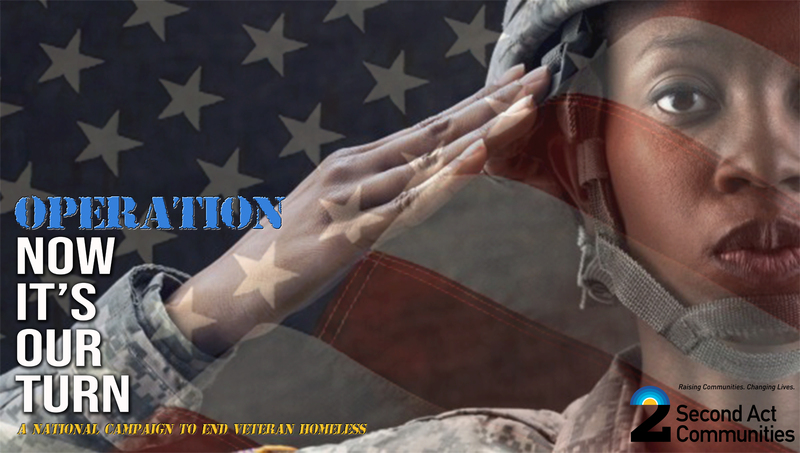 Our mission is to bridge the gap for the homeless veterans that were not qualified for government homelessness services. Proceeds from Operation: Now It’s Our Turn will be used for the development of our newest veterans facility, Cypress Landing in Chesapeake, Virginia. Second Act Communities would like to thank you for all of your support that you have given so far. This year we will offering sponsorship opportunities for our 2018-19 campaign, Operation: Now It’s Our Turn. These special sponsorship opportunities will give you a change to work closely with our organization and have a fulfilling engagement with the community. Below you will find our Operation: Now It’s Our Turn Sponsorship booklet. Feel free to look through it and find out what opportunity is best for you. We look forward to being able to highlight your continued participation and support of our work! Open the Door is a fundraising campaign for Cypress Landing Supportive Housing Apartments to be developed in Chesapeake, Virginia. Cypress Landing will be the second “permanent” affordable apartments in Hampton Roads developed for disabled and homeless veterans. Cypress Landing will be the second “permanent” affordable rental units in Hampton Roads developed for disabled and/or homeless veterans of the U.S. Armed Forces and will consist of 44 one-bedroom and 6 two-bedroom apartments. The non-profit developer, SECOND ACT COMMUNITIES, will provide some case management and coordinate additional supportive services through the local Veterans Administration Center and other area service providers. Any disabled and/or homeless veteran meeting the eligibility requirements can apply. Twenty-five (25) apartments will be fully accessible and three (3) units will be sensory accessible. ​The proceeds raised will support Second Act Communities mission of developing our Homeless and Disabled Veterans’ development in Chesapeake, Cypress Landing. Cypress Landing will be the second “permanent” affordable apartments in Hampton Roads developed for disabled and homeless veterans. The projected opening date is Summer of 2019. For more Information about Cypress Landing visit www.openthedoorsac.com today! If you would like to Volunteer with Operation: Now It's Our Turn, please fill out the form below.